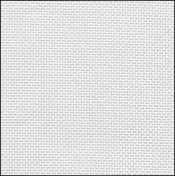 White/Silver 32ct Cotton/Rayon Evenweave  - $50.00 : Yarn Tree, Your wholesale source for cross stitch supplies. Item 4118. White/Silver cotton/rayon evenweave. 32ct. 38"x35". Similar in color to DMC B5200 with silver shimmer. This pretty fabric has an opalescent appearance.